The all-purpose method: Pep your body up with neutralization - natur-apothekes Webseite! With the help of a permanent intake of alkaline minerals and amino acids you increase the pH-value within the cell fluid and create with it a perfect nutrient medium against the growth of deseases and damaging deposits within the body. Akti-Lysin: 60 capsules each 500 mg ess. L-Lysin. 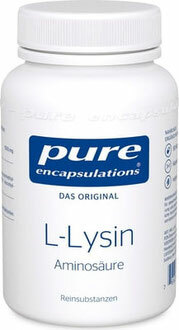 Lysin in its natural L-form is an essential, herbal amino acid with a high alkaline fraction. This amino acid serves for a fast energy production within the cells. Product effect: Akti-Lysin works against the hyperacidity in the body, absorbs acids and flushes them out, also adds bases and remineralizes the body.